Climate change could be putting salmon and trout at risk, according to work by Cardiff University scientists. Researchers studied young salmon and trout populations in the River Wye and its tributaries between 1985 and 2004. The study found salmon numbers fell by 50% and trout by 67%, with the fish hardest hit following hot, dry summers. However, the Wye and Usk Foundation said since the research, wet summers had brought improvements to young salmon and trout "densities". The university team said results suggested that warmer water and lower river levels combined to affect both species. Professor Steve Ormerod, of the university's school of biosciences, said salmon and trout fishing generated many jobs and large economic benefits. "In Wales alone, salmon fishing contributes around £90m annually. Any risk of eventually losing these species to climate warming is therefore one we must consider very seriously," he said. "We suggest measures to ensure that river levels are maintained in hotter conditions alongside the use of riverside trees to create shade and protect against the highest temperatures." The recorded fall in salmon and trout numbers was despite the river becoming cleaner. The researchers used data on fish collected each year by the Environment Agency at more than 50 locations in the Wye catchment, mostly in Wales. The team said stream temperatures had increased over the study period by 0.5C to 0.7C in summer and 0.7C to 1C in winter. The researchers said water temperature was known to affect the growth of the fish and their susceptibility to disease, while lower water levels restricted their access to cooler habitats. A paper on the findings has been published in environmental journal Global Change Biology. Peter Gough, fisheries scientist with Environment Agency Wales, said: "We recognise that climate warming is probably already affecting many elements of our natural environment, including salmon, trout and sea trout, and this detailed analysis of our long-term data is extremely interesting and, if proven correct, would be of great concern." He said the agency was examining the results and other data. "There is a suggestion that earlier migration to sea of salmon smolts might account for at least part of the apparent decline, but this doesn't explain the reduction in trout numbers. More work is needed to clarify some important issues," he added. Dr Stephen Marsh-Smith, executive director of the Wye and Usk Foundation which works to restore the habitat, water quality and fisheries of the rivers, said the study was a "welcome and thought provoking piece of work". He said: "However, there are a great number of factors that affect salmonids (salmon and trout) and it remains a continuous challenge for researchers to be able to separate one causal factor or interaction from any other with complete certainty. "Nonetheless, climate change brings with it enormous difficulties especially for rivers with abstraction and increased siltation heading the list of damaging effects. "Paradoxically since this research, a series of wet summers have brought improvements to (Wye and Usk) juvenile salmonids densities but not universally as would be expected if climate change were the prevailing factor." 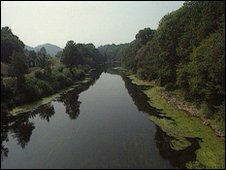 In 2008, the foundation said the number of salmon caught in the river Wye had exceeded 1,000 for the first time in 12 years after £5m worth of improvements to the river. Figures showed a total of 1,066 salmon were caught by anglers, with up to 80% returned to the water. In its heyday, 3,500 salmon were regularly caught by anglers on the river each season but the numbers started dropping in the 1970s.